In preparation for our 2018 Musical Chairs fundraising event, where brave members of the public will learn a new instrument or dust off an old instrument and join a scratch orchestra for a day in aid of our work with young people with complex lives, we're talking to some of our intrepid musicians about their experiences. What instrument are you playing at Musical Chairs and have you ever played this instrument before? I’m playing the clarinet for the first time - total beginner! Why did you choose this instrument? What is it that you like about the instrument? I wanted to try a reed instrument and the oboe was too hard so I thought let me try the clarinet first. Why have you decided to take part in Musical Chairs? I took part in Musical Chairs 2017 for the first time, playing the flute. I loved it! 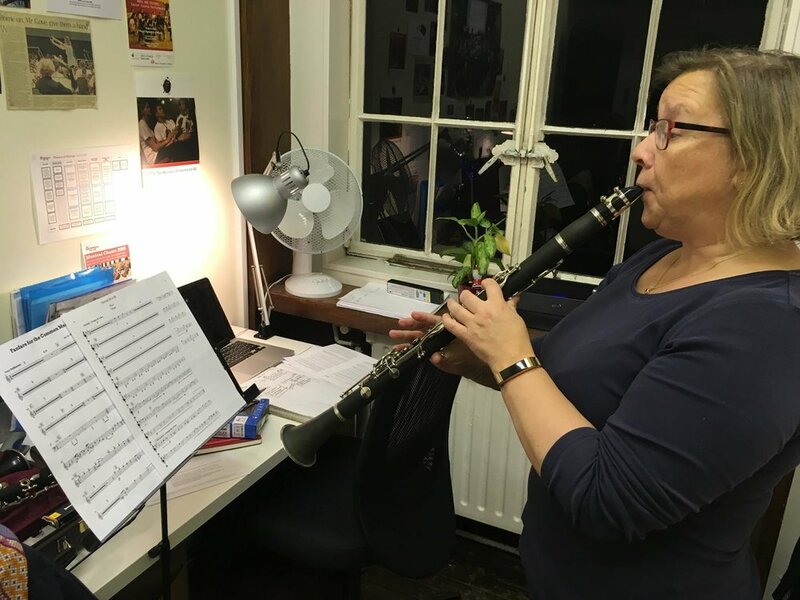 I enjoyed picking up the flute after 20 years break but even better was on the day playing in a group and the wonderful feeling of it all coming together. Amazing! How did you hear about Orchestras for All and what interests you about their work? I think music is a key part of life and learning to play an instrument, practicing and coming together as group is a great thing. Orchestras for All helps bring more children to music and will help them not just get better musicians but teaches them life skills that will help them in the future. How have you approached your practice? What have you enjoyed? What have been your main challenges? I’ve started with just getting a sound out... not the easiest with a new instrument! Then just getting the grip working - had to get help to work out how to go up an octave! Now I am working on improving the sound and my reading of the notes. In January I will start practicing the actual parts. Slowly does it, a little everyday! How has your fundraising for Musical Chairs been going so far? What are you most looking forward to at Musical Chairs? What are you most nervous about (if anything)? What would you say to someone who maybe needs some convincing to sign up? Just do it! There are parts to fit your level and there is help to be had to learn the basics. If you used to play an instrument then this is the perfect time to pick it back up! There's still plenty of time for you to join Eva at Musical Chairs 2018 - find out more about the event and sign up for the event here.